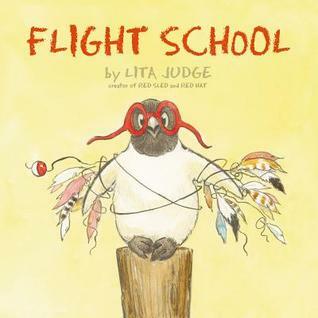 Flight School by Lita Judge is a nominee for the 2016-17 South Carolina Picture Book Award. Little Penguin knows he was born to fly. So what if he’s a penguin? He has the soul of an eagle, and he won’t let anything stop him from feeling the wind in his feathers. The other birds at Flight School aren’t convinced, but they agree to let Penguin give it a try. It doesn’t exactly go well…at first. Eventually, though, Flamingo comes up with an idea that lets Little Penguin soar. Finally, he’s in the air! He just needs a bit of help getting there. Maybe the resourceful birds at Flight School can help his buddy Ostrich spread his wings, too! Flight School, which is an excellent pick for read-alouds, is a great book on the importance of having a goal and accepting help in achieving that goal. It could also lead into some discussions of the various birds throughout the book and their characteristics, most especially the ability to fly (or not). Here’s a short book trailer I created to help promote this book at my school. Feel free to use it if you like! One Cool Friend is a nominee for the 2013-2014 South Carolina Picture Book Award. One Cool Friend, written by Toni Buzzeo and illustrated by David Small, is sure to be a hit in any library. Readers young and old will be charmed by Elliot, a very proper young man (who I imagine with a British accent). Hilarity ensues when Elliot brings a real penguin home and learns what it takes to keep a pet penguin happy. Can he keep his penguin a secret from his dad, though? Every reader will be eager to see what happens, and they may be in for a few surprises! 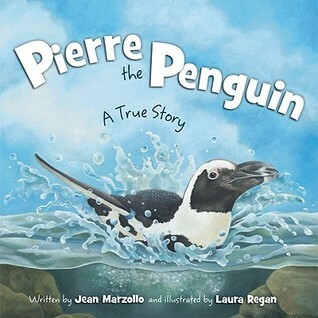 Pierre the Penguin, written by Jean Marzollo and illustrated by Laura Regan. is a true story and is nominated for this year’s South Carolina Picture Book Award. The pictures are detailed, and the rhymes used to tell the story are fun and informative. Pierre is a penguin who didn’t molt for a few seasons, so his feathers became brittle and fell off. As a result, he didn’t swim because the water was too cold on his featherless skin. To help Pierre out, Pam Schaller, an aquatic bioligist at San Francisco’s California Academy of Sciences, fashioned a neoprene wetsuit for Pierre. This wetsuit allowed Pierre to swim with the other penguins, and his feathers eventually grew back. Young readers will be especially interested in Pierre’s story, and I’m so glad that there is a question and answer with the aquatic biologist who cared for Pierre at the end of the book. This is extremely helpful! If you’d like to learn more about the penguins at the California Academy of Sciences, check out their live penguin cam at http://www.calacademy.org/webcams/penguins/. 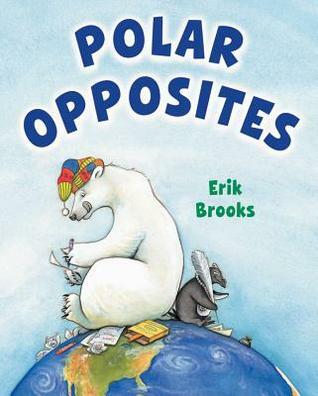 Polar Opposites by Erik Brooks, a nominee for the 2012-13 South Carolina Picture Book Award, is about a polar bear and a penguin and how they are opposites in every way. One lives in the Arctic; the other lives in the Antarctic. One is neat; one is messy. The list goes on and on, and there are even some “opposites” that are not outright mentioned. I especially enjoyed learning that one is a Republican while the other is a Democrat (glimpsed in campaign posters on their walls). Both are baseball fans, but one pulls for the Red Sox while the other roots for the (hated) Yankees. The text in this book is very easy to read, and the illustrations are absolutely charming and have tons of little details that older readers will appreciate. A definite winner! 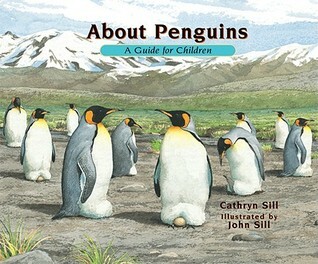 This book, written by Cathryn Sill and illustrated by John Sill, is a great introduction for young readers who want to learn more about penguins. The popularity of films like Happy Feet and March of the Penguins has increased the fascination with these animals, and About Penguins provides young readers with some easy-to-understand information about the different types of penguins, their habitats, behavior, and what we can do to protect them. The illustrations in About Penguins are very detailed, and the explanations of each plate at the back of the book go a long way in giving readers a great deal of information about penguins. There is also a helpful glossary and recommended books and websites for those who wish to learn even more about penguins. About Penguins is a great book for students in kindergarten through second grade, possibly even older readers, who are studying animals.